God faithfully supplies His grace to every area of our lives. His grace is flowing freely until we choke the flow by allowing the devil to get us worried and troubled! Jesus' last will, and the greatest gift, that He wanted to leave behind for His disciples before His crucifixion was the gift of peace. Our Lord is called the King of Salem. (Hebrews 7:2) "Salem" means "peace". He is also called the Prince of Peace. When He was on earth, He walked in such peace that He was always in control. They tried to stone Him once, but He just walked through the midst of them unharmed. (John 8:59) No one could touch Him. He had perfect and absolute peace. The devil ruffled up a storm in the Sea of Galilee, but Jesus just continued sleeping in the boat. The devil's attack did not wake Him, only the cry of His disciples did. (Mark 4:35-41) Even in His death, He was in control. No one took His life from Him. He laid down His life. (John 10:17-18) He made the choice in the garden to lay down His life for us. Jesus was and is always in perfect control. And one of the reasons He was so powerful was that He walked in the shalom (peace) of God. The word "peace" in John 14:27 is the word "shalom" in Hebrew. It means wellness, wholeness, completeness, as well as peace of heart and mind. So having shalom means having every part of you--spirit, soul and body--well. So what did Jesus mean when He said, "Shalom I leave with you. Not the world's shalom, but My shalom"? This is what He meant: "The shalom you saw Me living in; the shalom you saw Me sleep in, in that boat; the shalom you saw Me walk in, in the midst of the people who wanted to stone Me; the shalom that renders the devil powerless to touch Me; this shalom, My shalom, I give to you." This is the peace that Jesus has bequeathed to us. It is not a worldly peace that comes through soothing music, meditation or deep breathing. It is more robust than that! It is not dependent on circumstances and it works in the midst of the storms of life. "But Pastor Prince, if Jesus has given me this peace, why am I still so troubled and worried about many things?" It is because you have allowed your heart to be troubled. Notice that immediately after Jesus said, "Peace I leave with you, My peace I give to you...", He said, "Let not your heart be troubled, neither let it be afraid." You have to let not your heart be troubled or afraid. The Lord cannot "let not" for you. Your wife cannot "let not" for you. I cannot "let not" for you. You have to "let not" yourself! Many people are guarding their finances, careers, children, health and so on. But the Lord does not want us to guard these things. Instead, He wants us to guard our hearts. This should bring us relief. We don't have to worry about so many things. We just have to guard our hearts. People make foolish decisions when their hearts are troubled. They do things that they would otherwise not do. So guard your heart. The Lord said to me once that if we will guard our hearts from being troubled or afraid, then if it is a miracle we need, a miracle we will get! The way you guard your heart from being troubled and afraid is to quote John 14:27. Whenever trouble comes to your heart or you feel fearful, say, "I will let not my heart be troubled, neither let it be afraid." And you will release the power for the fulfillment of the verse. The peace of God will start flowing in your heart. For example, while I may at times worry about my daughter because I love her so much, I am just not worried about my finances. Even when I was a student and my family was not well off, I was not worried about money. God gave me a grace ever since I was born again to not worry about money. In fact, the Lord said to me recently, "Son, have you noticed that the devil cannot get you in the areas of your life that you are not concerned about? The areas that you are not troubled about are the areas where you see My grace at its best, My blessings at their richest." When He said that, I began to realize that there were other areas besides finances that I was not troubled about and where God's grace flowed freely. Some people think that their problems are too small for God to handle. "I am too embarrassed to tell God what troubles me. It is just a pimple that has been there for a few weeks." Listen, if it causes your heart to be troubled, it is not a small thing! God wants you to cast it to Him. He does not want your heart troubled by anything, big or small. And if you will cast it to Him and let not your heart be troubled, His grace will flow freely in that area of your life. Jesus is telling us that the Holy Spirit teaches us all things on the wavelength of peace. In other words, if you guard your heart from being troubled by a problem, if you refuse to worry about it and just abide in His peace, the Holy Spirit will "teach you all things". He will show you the way out of the situation! A number of years ago, I experienced some pains in my stomach, and finally went to see a specialist. Convinced that I needed to do a scope, he told me, "You never know, these symptoms that you have, you may think that they are nothing, but..." I looked at him and, you know, faith comes by hearing, but fear also comes by hearing! After the consultation, I told myself, "Nah, forget about what he said. I am a man of faith!" But his words kept coming back to me. And as long as the symptoms were there and I had not had the scope done, I continued to be concerned about my symptoms. So I finally went for the scope. "Why not just settle it once and for all?" I told myself. As it turned out, there was nothing wrong with my stomach. The pains were just lying symptoms! But do you know what happened during those months? I watched what I ate very carefully. I was fearful for my health for the first time, so much so that I began to eat organic food and drink carrot juice every day! I told my wife Wendy that I had to have brown rice...no white rice for me. Even when we ate out, I would bring along my brown rice! I was that radical. I also began to read Christian books on dieting. And I ran for about 45 minutes almost every day until I was so skinny! As I was meditating on all this, the Lord began to show me the modus operandi of the devil, the way he operates. First, he comes to you and he sees an area of your life that he wants to attack. But he knows that he has no power to harm you...Jesus stripped him of all his power. (Colossians 2:15) So the only thing he can do is to get you worried. In other words, whenever you are full of cares and are not casting your cares to the Lord, you become "devourable" to the devil. But the opposite is also true: The devil cannot manage a peaceful Christian! No, he has to get you ruffled, troubled, worried and fearful first before he can touch you. Here is an illustration that the Lord gave me to help you understand what I am saying. Imagine that there are many pipes coming down from heaven. These are flexible pipes and they are all ministering God's manifold grace into every area of your life. There is a grace for healing flowing into your life, a grace for prosperity, a grace for your marriage and so on. Once you are a believer, you are righteous by faith and you have "access by faith into this grace in which we stand". (Romans 5:2) When it comes to the benefits and blessings of God, all of us, whether we are pastors or ushers, enjoy the same inheritance. We are all on equal footing on the ground of grace. When Jesus died on the cross, there was an earthquake and God's heart burst open, and streams of His love, grace, mercy and blessings just flowed out. And since God is eternal, these streams are eternal. They have been flowing ever since Jesus died. They are flowing all the time. 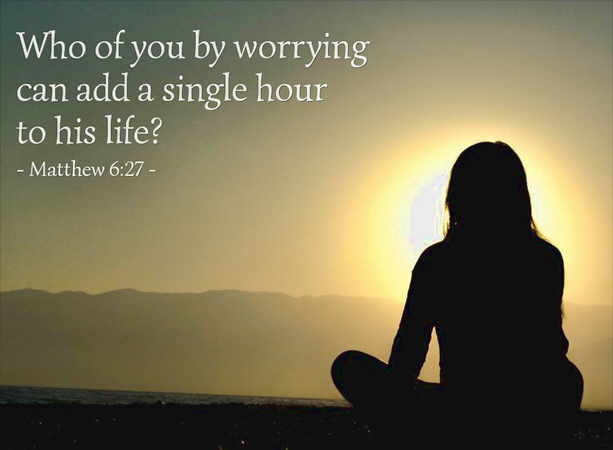 But what happens is that when we worry, it is as if we are grabbing hold of those flexible pipes, and hindering the flow of God's grace into those areas of our lives. The more we worry, the tighter we grip the pipe and the more it becomes choked. Is His grace still being supplied from heaven? Yes, but the pipe is clogged up with our worries and cares. Conversely, in the areas that we are not worried about, His grace flows freely, producing thirtyfold, sixtyfold and finally hundredfold results. All the devil can do is give you lying symptoms and hope that you will be troubled. Once you are troubled and worried about those symptoms, and start thinking about them all the time, you begin to hinder the flow of God's grace into your health. Again, God is still supplying the grace. He is faithful. It is your worrying that is clogging up the pipe. Don't be anxious. There is no use praying worried prayers. Just tell the Lord about the problem and cast your cares to Him, knowing that He cares for you. (1 Peter 5:7) Let it go. Then, thank the Lord that He has heard you and is doing something about the problem. If you do this and refuse to be troubled, "the peace of God, which surpasses all understanding, will guard your hearts and minds through Christ Jesus". Remember: The devil cannot handle a peaceful Christian. When my daughter Jessica started first grade, she would miss her mother and call home during her break. One day, she could not get through to her mother and became very anxious. It was a traumatic experience for her. When she came home that day, I spoke to her about what had happened. I was very concerned about her. It hurt me to see her so troubled. She kept saying, "I don't want to go to school. It is like a nightmare. I want to be with Mama." I tried to reason with her, but it was like she was just not listening to me. I finally left her with her mother and went to my room. I was frustrated that my daughter was worrying at such a young age. I was even feeling a little angry toward her. So I sat down and told the Lord, "Lord, I don't want her to be troubled. She is so young. And I just feel bad about being angry with her. I am confused, Lord." The Lord said to me, "Son, why are you so concerned about her?" I said, "Well, I just don't want her to worry." "Is that the real reason?" There was silence for a while. Then, He asked, "What is the reason you don't want her to worry?" I thought about it for a while and then like a flash I saw the real reason: I love my Jessica so much that I want her to be carefree! I want her to enjoy life. I don't want her, at such a young age, to be thinking, "What if tomorrow I call and Mama is not there? What if...What if..."
I don't want her to worry because I love her so much. It gives me a big thrill to hear her break out in a belly laugh when she is watching her favorite TV program, or when Wendy and I are kissing her belly on the bed. It makes us happy to hear her laugh. But it makes us sad to see her cry or even worry at that tender age. So it is not that I don't want her to worry because I just don't want her to worry, or because I am a pastor. I don't want her to worry because I love her very much and I want her to be happy. When I realized that, the Lord said, "Son, now you know how I feel toward you. 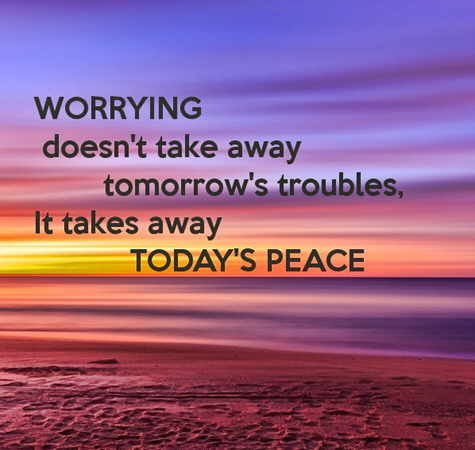 I am not telling you not to worry for the sake of not worrying. I am telling you not to worry because I love you so much and I want to see you happy. I want you to enjoy life and, most of all, enjoy My love in your life." Beloved, I hope that you will not forget what the Lord said to me. Your Father wants you living life carefree, enjoying His love and knowing that He watches over you. He really loves you. And perfect love...knowing this perfect love...will cast out every fear in your life. (1 John 4:18) Which of you by worrying can add one cubit to your stature? (Matthew 6:27) So let not your heart be troubled, neither let it be afraid, and the grace of God will flow freely in your life, causing you to see His blessings at their richest!